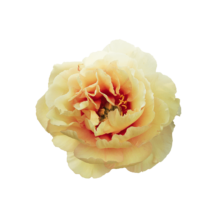 A coral-coloured core, salmon pink and cream petals: Canary Brilliants is lovely in appearance. The flowers are completely double and have an apricot colour when they are closed. We can guarantee you a vase life of four days: long enough to enjoy her feminine character. Canary Brilliants is an Itoh peony. An Itoh is a cross between a tree peony and a lactiflora. The tree peony has more difficulty absorbing water well when it is cut off, which makes it less durable. Fortunately, we have invested in new nutrition with which we can guarantee a vase life of 4 days. Is that worth it? Every penny of it! Colours like this are unique in nature: she is absolutely an eye-catcher. Like Cora Louise, Canary Brilliants is another Anderson creation. She was registered in 1992.